Blink! is a state-of-the-art light and sound show set to the music of the Holiday Pops. 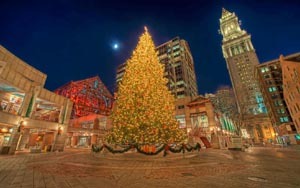 The lights dance seamlessly to the music through every inch of Faneuil Hall to create a spectacle not to be missed. The entire six week show will use the same amount of electricity as an average American household uses in a month. It runs every night from 5 p.m. to 10 p.m. through January 5. Stay in the left lane and turn left onto North Street at the end of the ramp. Turn left at the dock square garage and follow signs toward aquarium to the Southbound Surface Artery. Turn right at State Street. Continue three blocks and turn left onto Broad Street. The garage entrance for 75 State Street is on the right. North (Exit 24B on left). Merge onto I-93 Northbound to enter the Central Artery Tunnel and proceed North about 1/2 mile underground to Exit 23. I - 93 South to Exit 24A (Government Center). Follow signs for the Aquarium to Southbound Surface Artery.